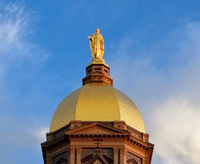 The Notre Dame Graduate School is pleased to announce the winners of the 2012 Eli J. and Helen Shaheen Graduate School Awards, the highest honors bestowed on Notre Dame graduate students. Named in honor of a Notre Dame alumnus and his wife, the award recognizes the top graduating doctoral degree recipients in the Graduate School’s four divisions: Humanities, Social Sciences, Science, and Engineering. Nominated by their departments, Shaheen Award winners are chosen for their superior ability as exhibited by grades, research, and publication records, fellowships and other awards received during the course of study at Notre Dame, as well as teaching ability. Fox’s work has provided groundbreaking insights into medieval concepts of mental activity and understanding. With a book on the educational program of King Alfred the Great at the end of the ninth century forthcoming, she is researching a second book on forms of madness in Old English poetry and saints’ lives. She has already authored five publications in journals of the first rank in medieval literary studies, including Philogical Quarterly and The Review of English Studies. Fox has been contracted by the Cornell University Press to prepare a student edition of the well-known medieval poem, “The Owl and the Nightingale.” She has won two external awards of great distinction: a Mellon/American Council of Learned Societies dissertation completion fellowship and the highly competitive New Faculty Fellow Award, which she declined to accept a position as a collegiate assistant professor at the University of Chicago. Gervasoni’s dissertation is a synthesis of research on democratization at a sub-national level, focused on his home country of Argentina. He has published his findings in the top-ranked journal in his field, World Politics, in a piece that has garnered considerable attention around the globe. In addition, he has published four articles and a chapter in Spanish and another three articles in English in leading comparative politics or area-studies journals. The winner of a Kaneb Center teaching award while at Notre Dame, Gervasoni is now an assistant professor at the Universidad Torcuato di Tella, Argentina’s finest social science institute and one of the best universities in all of Latin America. With infectious disease continuing to be the leading cause of death worldwide, Wencewicz’s work in the areas of developing antibiotic chemotherapies based on new scaffolds and microbe-targeted drug-delivery techniques is of great importance. He has authored eight papers in peer-reviewed journals, including the Journal of Medicinal Chemistry and The Journal of Biological Chemistry. A gifted teacher as well, Wencewicz has mentored undergraduates in their research and won two teaching awards, one from his department and one from the Kaneb Center. Over hundreds of other applicants, Wencewicz earned a postdoctoral position at the Harvard Medical School with Dr. Christopher Walsh, a preeminent scholar in the fields of enzymology and pharmacology. With fossil fuels dwindling and environmental concerns rising, the need for alternative energy sources is greater than ever. Deshlahra’s research focuses on novel ways to manipulate the activity of heterogenous catalytic materials. He is the author of eight articles, including publications in the Journal of the American Chemical Society, the top general-coverage chemistry journal in the world, and Langmuir, the top journal of surface science. He won the 2011 Center for Computational Research Award and has served as an exceptional teacher and mentor to both graduate and undergraduate students. Deshlahra is currently a postdoctoral researcher at the University of California at Berkeley with Enrique Iglesia, a leading researcher in the area of heterogeneous catalysis.